Situated in the center of the mystical goings-on of Salem, it is unsurprising that the Hawthorne Inn boasts a few unexplained occurrences. Several guests of Suite 612 have reported to Inn staff that they felt a restless presence pacing all over the room during the night. Two guests also reported seeing a spectral woman gazing longingly at the door to Room 612. In February 2000, a guest booked into Room 325 approached staff members to complain he was not told he would have to share the bathroom of his two-room suite with another guest. The distressed guest explained he had heard the sink running, the toilet flush, and the television on in the other room. He would not believe no one could have accessed his bathroom until hotel staff led him upstairs to show him there was only one door into his suite. The man remarked that he had no problem sharing his room with a ghost, he just didnt want to share it with another guest. 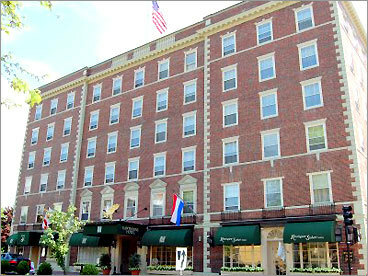 The Hawthorne Hotel was recently featured on the TV series Ghost Hunters, and when the show's paranormal team examined the hotel, they could not find any evidence for — or against — ghosts.